Material: The fabric is very soft, surprisingly lightweight and warm to touch and quickly repels moisture. It is multi layered and was both wind proof and waterproof. I tested it in horizontal rain in Macclesfield forest with significant wind chill and remained warm and comfortable. Fit: Tester: male, 5'9", stocky build. No problems with fit the fleece is snug and the pull cords work well and are positioned correctly. Collar: High enough to shield neck from the wind. Zip goes all the way to the top of the collar. 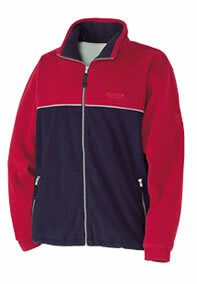 Surprised that a fleece designed as a waterproof garment does not have a hood (In heavy rain, water ran down my neck! Also no elasticated cuffs. Pockets: Two pockets on front. No map pocket. Zips: Front opening zip is lightweight but robust but does have an irritating tendency to get caught in the flap material. Some light stitch back would help with this. The pockets are well positioned but sadly no inside pocket or map pocket. Other considerations: The Regatta Keel fleece is a good quality fleece ideal as a mid-layer in winter - could be used as an outer layer on a spring/summer day. Lightweight material so easy to carry. The Regatta Keel fleece is waterproof, good windcheater and warm although there is a tendency for the zip to catch in the flap - or is that just me?